Avocado sunblotch disease could be a problem for our avocado growers and avocado trade. The sunblotch viroid comes from the same places avocados do – Central and South America. It only affects avocados. 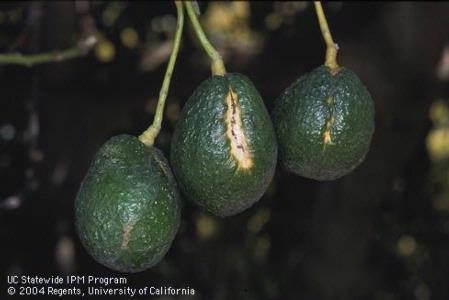 Avocado sunblotch disease damages avocado trees and fruit, meaning fewer fruit are produced. If the disease was found here, international trade in avocado fruit is likely to be affected. The disease can’t survive for long outside of the plant, so it can only come into New Zealand in infected plant material or avocado stones. MPI has strict measures in place to limit the chances of avocado sunblotch making it through the border. But we need you to be vigilant too. Whenever travelling to New Zealand, always declare any food or fruit in your luggage. If you fail to do so, you could face a $400 fine. deformed leaves with bleached-looking, yellow or white areas. Fruit affected by avocado sunblotch viroid.